Board index General Discussions Recorded best scores. You're probably right, my COD setups including SG never work very well. Hmm, next time I should be silent, you should fig... wait no, at the end you shared your AI from seven wonders and set your priorities, so it is ok. If you share, I share. If you don't, I share nevertheless. 1740 from nullpointer! (497 games played and 387 victories). Nullpointer you have the duty to post the best score when you reach it, because I cannot see all your updates. Nullpointer 1761, 393 wins, 504 games. Nullpointer 1777, 507 games, 396 victories. edited the first post to collect record best. Nullpointer 1784, 508 games, 397 victories. Nullpointer 1794, 513 games, 401 victories. and congrats! The higher you get the more difficult, you may only draw! I wonder how my new COD AI will do against yours now. I'm insisting on using the SG. When we get paired. Nice usage of the sg, I love this game and the creativity that it generates. Have you been paired with wawwa yet? He has a nice idea too. He got from 1201 points to 1403 within today. Don't worry, I gave him like 20 points or more (so I'm like Robin hood, I take from the lower ranks to give to nullpointer, and... wait, that was not robin hood). 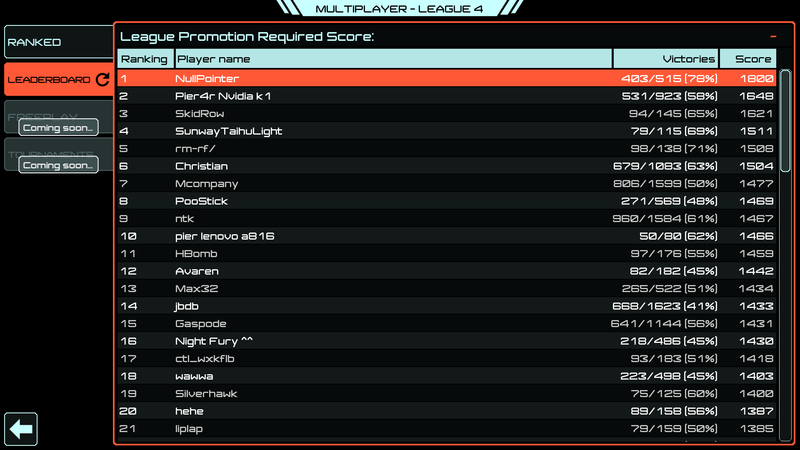 NullPointer wrote: I wonder how my new COD AI will do against yours now. I'm insisting on using the SG. Just to know, how many active AIs do you have already? I have 20 AIs not counting the ones I use for testing. 1818 was my top score, then I lost a match in Barred Spiral. Last edited by NullPointer on 12 Dec 2016, 10:28, edited 1 time in total. 20! What a passion! I have 4 generic (the base), 2 for COD, 2 for mind game. @nullpointer. If you join telegram (it is also via web browser) you can spam screenshot there quite quickly. Anyway recorded 1818 (see first post). Woah.